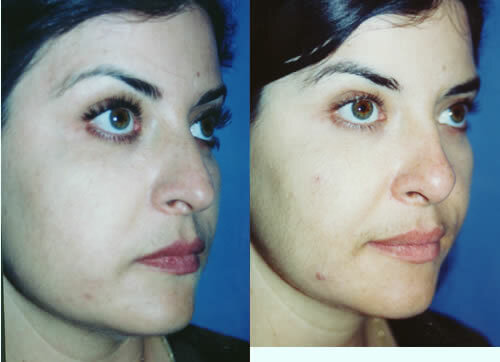 Rhinoplasty or nose surgery nose job in Los Angeles by Aaron Stone MD can improve your profile! Rhinoplasty also referred to as a nose job, nasal surgery or nose surgery to reshape the nose. Plastic surgery on the nose is one of the most common of all plastic surgery procedures. It can reduce or increase the size of your nose, remove a hump or bump from the bridge, change the shape of the tip or the bridge, narrow the span of the nostrils, slim down a bulbous nose or change the angle between your nose and your upper lip. Nose surgery may also correct a birth defect or injury, straighten a broken or crooked nose or help relieve some breathing problems or difficulty. The surgery is performed closed, a closed rhinoplasty, with incisions made only inside the nose or open, an open rhinoplasty, with incisions inside and on the strip of skin between the nostrils (columella). For a rhinoplasty to look right for your face you need a careful clinical examination. The nose should fit the aesthetic proportions of your face and permit the delivery of air to the lungs without nasal airway obstruction. When performed to correct a traumatic or congenital defect or to improve breathing the surgery is covered by your health insurance but you must get preauthorization from you insurance company before surgery to ensure coverage. 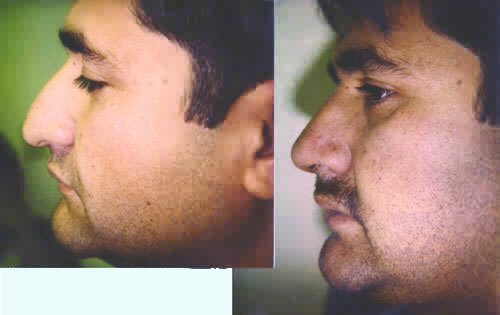 Before and after open rhinoplasty to raise the nasal tip and remove the hump on the bridge of the nose. Before and after closed rhinoplasty nose job to refine and raise the tip, decrease columellar show and remove a small hump on the bridge. Plastic surgery on the nose – rhinoplasty can enhance your appearance and your self confidence. Realistic expectations are important to be happy with any surgery. As each patient is an individual, different results can be expected in each patient. A non-surgical liquid rhinoplasty, which involves the injection of dermal fillers to the nose has become popular. Given the temporary nature of the injections and the limits of what can be done by just putting things in the nose in the absence of cartilage defects I do not see this as a replacement for surgery. Improperly placed injections can impede tissue blood flow, kill the overlying skin and leave you with an open wound that heals into a bad scar. As with any type of surgery there is the risk of infection or bleeding. Infection can melt grafts or force the removal of implants if any have been placed. Implants can extrude or shift out of position over time. Cartilage grafts may warp and/or partially or completely dissolve many years after the operation. If the tissues are thin the edges of implants or grafts may be visible necessitating placement of fascial grafts to hide those edges. Infrequently a permanent perforation may result from operation on the septum or scar tissue (synechiae) may form between the nasal septum and nasal sidewalls. These phenomena can also occur in the absence of surgery. The treatment of synechiae is straightforward but septal perforation can be very difficult to treat. The incidence of septal perforation dramatically increases if there is a history of cocaine use or chronic use of nasal allergy sprays. Rhinoplasty surgery involves changes to the cartilage and bone framework of the nose which then must be reflected through the skin in the end result. Thick unwieldy skin or scar tissue formed under the skin often has a mind of its own and may not conform to the changes made in the underlying framework. A perfect refined chiseled nasal tip may therefore not be achievable if this thick type of skin is present. Skin that is adherent to the bone due to prior surgery, trauma or eyeglass wear can tear when the skin is elevated off the bone during surgery. Open rhinoplasty can result in a visible scar on the columella. Surgery to straighten the nose may not result in a perfectly straight nose or the deviation may completely or partially recur some time after surgery due to cartilage shape memory. For younger patients the surgery may stop bullying behavior. It can improve breathing and result in nasal aesthetics that are more harmonious with your overall facial dimensions. There will be swelling for an indeterminate period. Much of the swelling will normally disappear in a few days but the remainder may require several weeks, or even months to disappear completely. Resolution of the swelling may be uneven resulting in temporary asymmetry of the nasal tip. There will be discoloration (black and blue marks) on and about the face, principally around the eyes, for several days or longer. Ice compresses are applied for the first 24 hours. You can place 3 wet washcloths in the freezer & serially apply them. Alternatively, a bag of frozen peas can be used as a compress. No vigorous or strenuous physical activity for 3 weeks, even jogging at 1 week can cause a problem. Normal non-strenous activities & work may be resumed within 1 week after the operation. Contact sports are prohibited for 3 months. For 7 weeks after splint removal only contacts or eyeglasses taped to the forehead can be worn. For 4 weeks after splint removal the sides of the nose are massaged as instructed to prevent shifting of the nasal bones and possible asymmetries. 90% of the swelling resolves within 10 days but it may take up to 6 months for the remainder to resolve especially the tip of the nose after open rhinoplasty. For 8 weeks after surgery protect the nose from excess sun exposure with #15 or greater sunscreen and/or wide brim hats.